Beauty is in the eyes of the "BEER" holder! :) What's up guys? Well, for me nothing much has happened. I'm planning to go out today for my much anticipated photoshoot with my dad but it all depends on my mood. (hihi) Anyways, today I took some photos of my make-ups. Enjoy! Cover Girl Lipstain in Teasing Blush. My super soft Baby Buki brush from Ellana. It's a cream blush and a loose powder in one from Beauty Treats Mineral from SM Dept. Store. 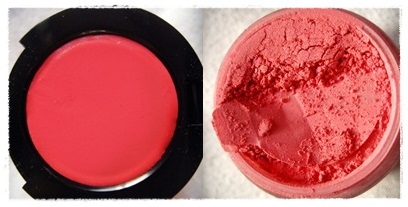 L-R: Cream Blush ; Loose Powder in Rose. A close up look of my Baby Buki and blush. Trying out my first BB Cream from The Face Shop. I will keep you guys posted for my review. And because I fell in love with the colors.